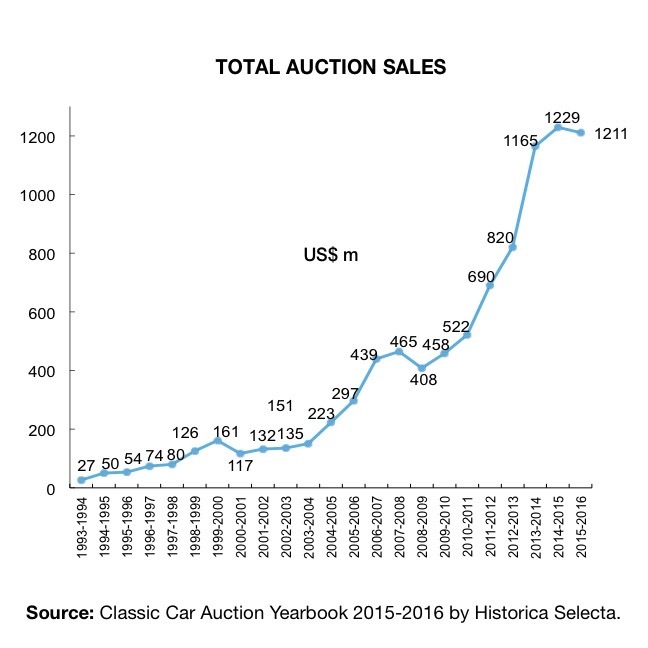 Sales at major collector car auctions hit $1.2 billion and 201 cars sold for $1 million or more between September 1, 2015, and August 31, 2016. 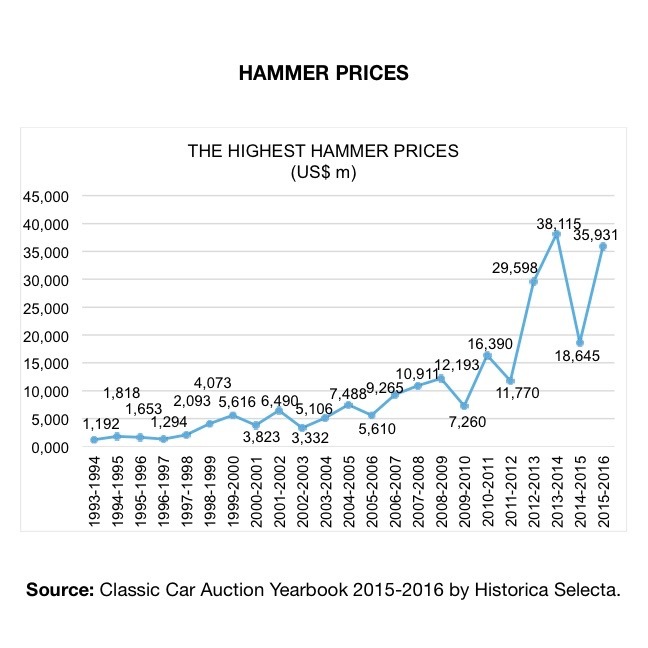 Sales at major collector car auctions hit $1.2 billion and 201 cars sold for $1 million or more between September 1, 2015, and August 31, 2016, according to the 21st annual edition of the Classic Car Auction Yearbook, being published Thursday in Padova, Italy, by Historica Selecta. He added that the sell-through rate at the auctions covered fell by 6 points, but overall eight more cars — 4,044 vs. 4,036 — went to new owners. “The average value estimate of some models dropped by 15-20 percent, but this slowdown was expected after years of increase and makes the market much healthier,” he added. According to the yearbook’s pre-publication news release, Ferraris represented about 30 percent of the total market in terms of sales dollars generated, with 812 sold compared with 576 during the previous year. The highest price paid for any car during the 2015-16 year was €32,075,000 ($37,794,319 at the exchange rate prevailing at the time) spent for a 1957 Ferrari 335 S in February at Artcurial Motorcars’ Paris sale during Retromobile. 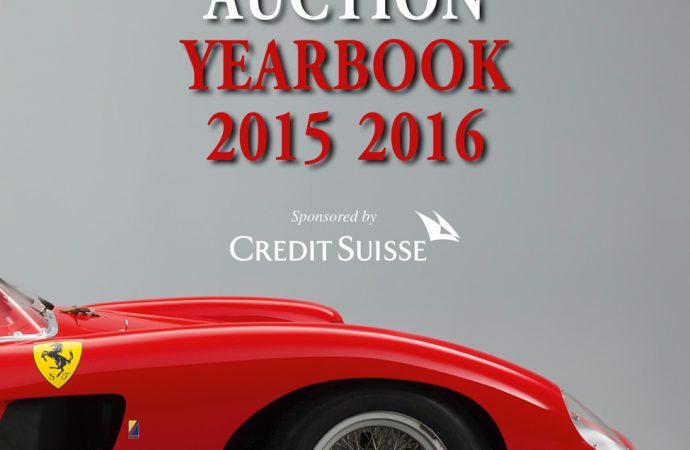 It is the second year in a row that Artcurial receives the yearbook’s “top sale” award. 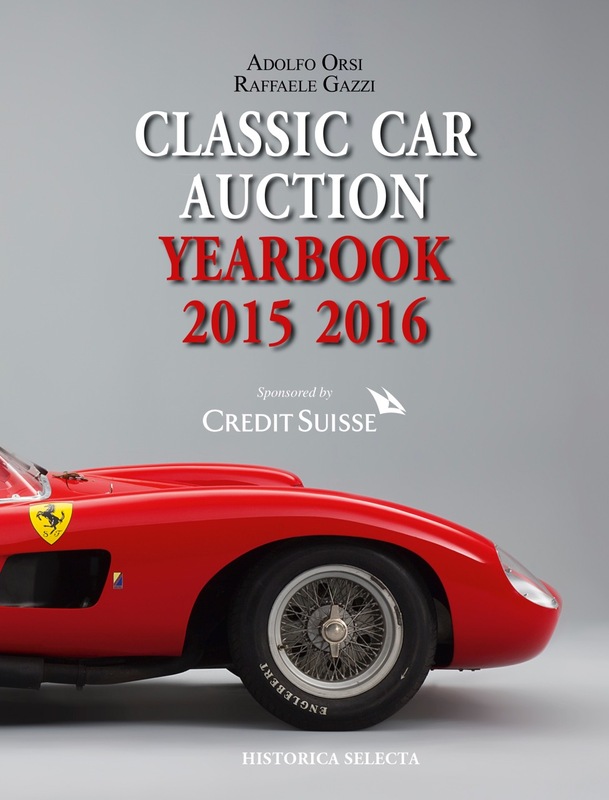 The Classic Car Auction Yearbook, underwritten by Credit Suisse Classic Car Program, details the sale of 5,644 cars at major auctions around the world, and tracks the results of specific marques since 1993. It also compares auction results in the United States, England and Europe as part of its market analysis. The yearbook spans 416 pages with 930 photographs and has a retail price of €70 and is available annually at automotive book sellers including Amazon (for $79). For information, visit the yearbook website.